Samir Chatterjee is the Fletcher Jones Chair of Technology Design & Management at CGU’s Center for Information Systems & Technology (CISAT). He is also considered a leading technology designer and strategist for 21st-century health care. His entry into health care field has been via Telemedicine. Today he leads the emerging field of Persuasive Technology, a stimulating interdisciplinary research field that focuses on how interactive technologies and services can be designed to influence people’s attitudes and support positive behavior change. 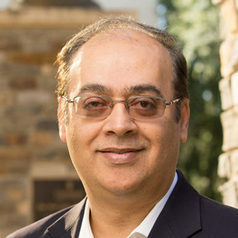 Chatterjee received a Bachelor’s of Technology in Electronics & Telecommunications Engineering (1988) from Jadavpur University, India; as well as an MS (1991) and PhD (1994) in Computer Science from the School of Computer Science, University of Central Florida. He joined CGU in July 2001. In May 2015, he was awarded the distinguished lifetime achievement award for contributions to Design Science Research, presented by the IS design community. He is also an adjunct faculty at Keck Graduate Institute, where he teaches a course on Healthcare Informatics. He has also taught in the Drucker School of Management’s Executive MBA Program. Throughout his career, Chatterjee has had substantial influence on the advancement of technology within the health care industry. He founded the Network Convergence Laboratory (now IDEA Labs), made possible by a grant from the National Science Foundation. He was co-founder and chairman of VoiceCore Technologies Inc., which he formed in 2001. In 2013, he founded DCL Health (Dr. Chatterjee’s Laboratories Health LLC), a wireless health care startup. He works closely with the Venture Capital and entrepreneurial startup community in the Southern California area. Since 2006 he has been an evangelist and champion of design science as a research method in the IS community. He started the successful DESRIST series of conferences, and his book Design Research in Information Systems: Theory & Practice, co-authored by Alan Hevner, is important in the field. One of his design methodology research (DSR) papers is the third-most cited DSR paper in the IS community. He works closely with his graduate students in the lab; at any given time, the lab has several ongoing projects, with six to eight doctoral students involved in various stages of their dissertations. His current projects include designing ICT and mobile solutions to address management of such chronic diseases as obesity/diabetes as well as oral health hygiene. He is also working closely with Loma Linda Medical Center on remote monitoring technology to assist patients with congestive heart failure.